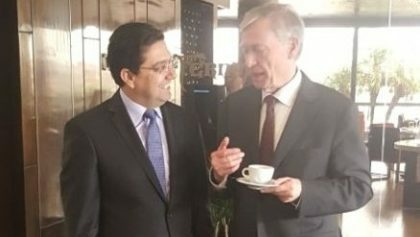 The bilateral talks held Tuesday in Lisbon between the UN Secretary-General’s personal envoy for the Sahara, Horst Kohler, and a Moroccan delegation, led by Foreign Minister Nasser Bourita, were “rich” and “fruitful”. The description was made by Nasser Bourita who pointed out that “overall, the discussions took place in an atmosphere of serenity and the debates were rich and fruitful”. The atmosphere was marked by “seriousness” and “mutual respect,” Bourita told the press after the talks, making it clear that it was “a bilateral meeting”. “This is neither a negotiation process nor a negotiation, but a meeting to discuss the developments of the Moroccan Sahara issue,” he said. Besides Bourita, the delegation included Morocco’s ambassador to the UN Omar Hilale as well as the presidents of two Sahara regions. These are Sidi Hamdi Ould Errachid, President of the Laayoune-Sakia El Hamra region and Ynja Khattat, President of the Dakhla-Oued Eddahab region. During the meeting with Horst Kohler, the Moroccan delegation surveyed the genesis of this regional dispute and the political, legal and geostrategic considerations that led to its creation in the 1970s. The delegation members also highlighted the efforts made by Morocco to implement a regional development model and roll out the structures of advanced regionalization, Bourita told the media, adding that they likewise detailed the Morocco-proposed autonomy initiative, the context wherein it was elaborated, its rich content and its very solid legal bases. The Lisbon meeting also provided an opportunity to discuss with the UN envoy the situation in the Maghreb, the cost of non-Maghreb and reasons obstructing the Maghreb construction, the Foreign Minister said. Nasser Bourita recalled that the Moroccan delegation to the Lisbon meeting was guided by the terms of reference outlined by King Mohammed VI in the speech he delivered on the occasion of the commemoration of the 42nd anniversary of the Green March, on November 6, 2017. In this speech, the Sovereign had re-defined the four firmly established principles and terms of reference on which the Moroccan position on the Sahara question is based, parameters that need to be respected for the process to be continued. One of these parameters is that any settlement of this artificial dispute must be conceived within the framework of Morocco’s full sovereignty, territorial integrity and national unity, Bourita recalled. Secondly, the process should include all the stakeholders in this dispute, the actual parties who have been at the root of this regional dispute. Thirdly, the process must be held under the exclusive aegis of the United Nations without the intervention of any other regional or international organization. And fourth, the process must focus on political issues, away from all the marginal issues that are often embedded in the discussions to divert the process from its primary objectives, added the Foreign Minister. In this connection, King Mohammed VI had stated clearly in his Green march speech Morocco’s “outright rejection of any transgression or attempt to infringe on Morocco’s legitimate rights or its best interests; rejection of any obsolete proposals designed to divert the settlement process from the set terms of reference, or to introduce or impose other issues which are dealt with by other relevant bodies”. The participation of the Moroccan delegation in this bilateral meeting, at the invitation of the Personal Envoy, is part of Morocco’s ongoing cooperation with the United Nations to reach a final political solution to the regional dispute over the Moroccan Sahara, the Ministry of Foreign Affairs and International Cooperation had said in a statement announcing the Lisbon meeting.